Success Stories stories at Techdirt. stories filed under: "success stories"
Some of the key points they've found so far are that fans are paying greater than $20 on average per band on its platform (more than a CD costs) and with big name "branded artists" that number is more like $50. But.. but.. but don't we keep hearing that no one wants to pay musicians any more? Apparently that's not true. 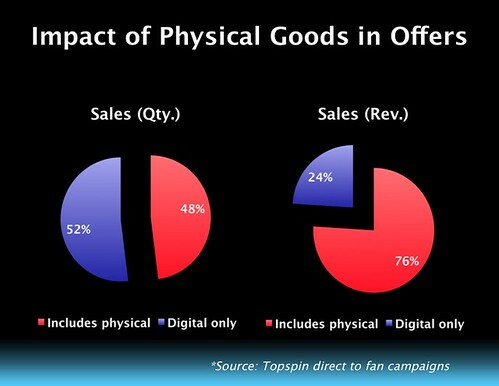 Digging into some of the details, Topspin found that while many people do pay for digital downloads, the big chunk of revenue actually comes from physical scarce goods: And while the number of folks who buy cheaper packages is much higher, the total revenue earned on higher priced packages is much, much higher. 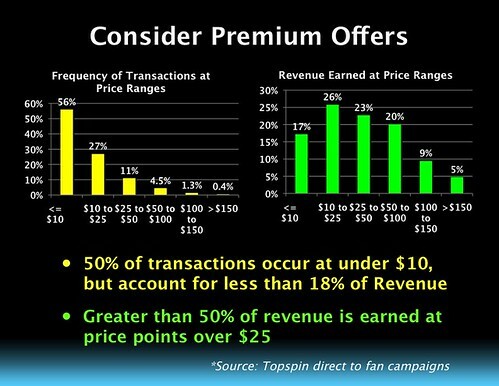 In fact, more than 50% of the revenue was earned on price points higher than $25. The under $10 sales, while making up more than 50% of the volume, account for less than 18% of the revenue: Again, it becomes clear: if you offer things of value people have no problem paying -- and often paying more than they did in the past. The claim that fans just want everything for free is pretty clearly untrue. I won't go through all the slides, but Shamal also spends a fair amount of time talking about converting fans into buyers, and (no surprise) suggests that it helps to have a real connection with the fans, as opposed to just putting stuff out and expecting people to just show up and buy. You can't give it away and pray, but have to provide a real connection and real scarcities. But part of making that work is getting widespread distribution (Topspin uses a music playing widget) that helps bring people to the purchasing options, if they like the music. Rather than trying to hold back and hoard access to the music, sharing freely, and connecting it to reasons to buy helps bring in a lot of fans who are happy and willing to buy. He also highlighted two case studies of amazing conversion rates. The David Byrne and Brian Eno album widget (the very first launched on Topspin) had a stunning 20% conversion rate of plays to purchases. Yes, one in five people who listened to the widget then purchased in the first few weeks of the campaign. That's an astounding rate -- and one I doubt many other bands would see, or sustain -- but still an amazing data point. In their case, since the average transaction price was over $15, it meant that every play was worth about $3 in sales. And yet some still don't believe that music online has promotional value that can lead to sales? The second case study was with Fanfarlo, who sought to build up its email list -- and found that for every 1,000 plays of the widget, 49 fans either purchased or signed up for the email list. The presentation compares that to paid advertising, which found that per 1,000 impressions, they ended up with 0.7 new email users. Once again: the music is a great promotional tool, much better than traditional advertising in actually driving a conversion. And, taking it one step further, to highlight the massive power of word of mouth, Topspin found that (again with Fanfarlo), the "Shares to Sales" ratio was 1.1. Yes, this meant that for every one person who shared the musical widget, more than one person ended up buying something -- though, admittedly, this number was likely skewed greatly by a $1 promo offer that ran for three weeks. But, either way, it shows that if you offer something that people want, at a good price, and you let people share (rather than punish them for sharing), great things can happen.